Michele Turcotte is a registered, licensed dietitian, and a certified personal trainer with the National Academy of Sports Medicine. She has more than 12 years of experience in clinical and corporate settings, and has extensive experience in one-on-one diet counseling and meal planning. She has written freelance food and nutrition articles for Trouve Publishing Inc. since 2004. Is White Rice Flour Gluten Free? Traditional grain-based flours from rice and wheat are high in carbohydrates -- they average 75 grams per cup. As a result, these flours are not suitable for use on a low-carbohydrate diet. There are many lower-carbohydrate flour alternatives, though you must combine some with wheat flour for best results. High-protein, low-carbohydrate flour alternatives include those made from beans, nuts and seeds, instead of grains. A 100g serving, or about 1 cup of defatted soy flour provides 372 calories, 52 grams of protein, 9 grams of fat, 1.3 grams of saturated fat, 31 grams of carbohydrates, 16 grams of dietary fiber and 9 milligrams of sodium. Soy flour is gluten-free and high in nearly all essential vitamins and minerals. In addition, because it is made from soybeans, it is a "complete" protein food, one that provides all of the essential amino acids. It is appropriate for those with a wheat allergy. The Soy Foods website recommends replacing 1/4 of the regular flour in a recipe with soy flour as long as it is not to make a yeast-raised product. You can replace more in recipes that are developed to use soy flour specifically. Flours made from sesame or sunflower seeds are available, though perhaps not as easy to find as soy flour. Sunflower seed flour, partially defatted, offers 326 calories, 48 grams of protein, 1 gram of fat, 35 grams of carbohydrates, 5 grams of dietary fiber and 3 milligrams of sodium per cup. 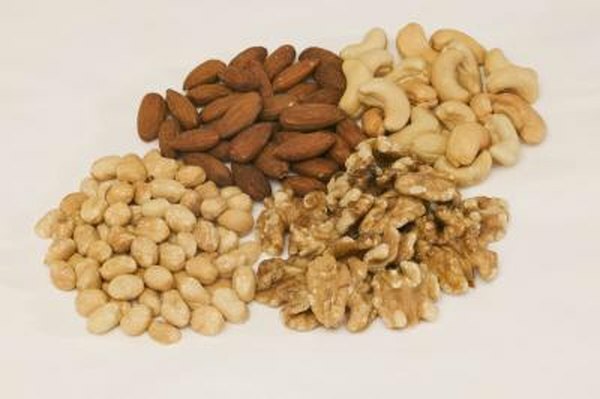 It is particularly rich in thiamin, folate, selenium, calcium, zinc, niacin, magnesium and other nutrients. According to research conducted in Portugal and published in June 1998 in Archivos Latinoamericanos de Nutricion, you can replace up to 50 percent of the wheat flour in a bread recipe without significantly sacrificing quality. However, a bread recipe composed of 70 percent wheat flour and 30 percent seed flour yields better results. Peanut flour, a legume-based flour like soy, is also gluten-free and low in carbohydrates. A 100g serving of defatted peanut flour offers 327 calories, 52 grams of protein, 1 gram of fat, 35 grams of carbohydrates and 16 grams of dietary fiber. You can substitute 30 percent of regular or self-rising flour with peanut flour in your favorite recipes. However, since peanut flour is not self-rising, you must add a rising agent in your recipe when appropriate. Almond flour, or almond meal, is made from ground blanched almonds and offers a pleasant, slightly sweet and nutty flavor. A 1/2 cup provides 320 calories, 12 grams of protein, 28 grams of fat, 12 grams of carbohydrates, 6 grams of dietary fiber and no sodium. It's a source of magnesium and vitamin E. You can use it for all baking applications but when making pizza dough, bread and muffins, but it will change their texture unless you also add wheat flour.